On May 12, the U.S. walked out of the Joint Comprehensive Plan of Action agreement, signed between the five Security Council Permanent members plus Germany (P5+1), and Iran. This agreement was a quid pro quo between the P5+1 countries and Iran. The agreement was for ending global sanctions against Iran, in lieu of dismantling a significant part of its nuclear program. Iran fulfilled its part of the bargain, and this has been verified by International Atomic Energy Agency (IAEA) in its numerous visits to Iran. It is the U.S. that is reneging on its commitments. This reneging on international agreements by the U.S. is not an isolated case. This is the pattern that the U.S. has been following now for the last 25 years. The U.S. negotiated the 1992 Kyoto protocols on climate change, significantly lowering its ambition, and then refused to ratify it. This is exactly what it did again with the 2016 Paris agreement. The price of having the U.S. in the Paris Agreement was to abandon targets for countries based on what was required to save the world from disastrous global warming. Under U.S.’s pressure, each country pledged what it would do, without addressing whether the cumulative effect of these pledges was enough to save the globe. The U.S. then broke from the Paris Agreement, the only country in the world to be outside the Agreement. The U.S. walked out of the nuclear agreement that it had reached in 1994 with the Democratic Republic of Korea or North Korea, claiming that it had violated the spirit of the agreement, “overlooking” that the U.S. was in violation of the letter of the agreement. In the Anti-ballistic Missile (ABM) Treaty, again it was the U.S. that unilaterally broke the treaty in 2002, deciding that it could ring Russia with ABM batteries. The Russian response has been to unleash a new set of weapons that can defeat the ABM shields that the U.S. has set up. The U.S. media’s response, except from the arms control experts, is to wonder why the Russia would be concerned by ABM shields. They seem to be completely ignorant that the ABM treaty was signed, not because ABM shields stop nuclear attacks, but because they create the possibility of a country striking first, and hoping that they can then ride out the weak return salvo. It encourages the possibility of a first strike. The acceptance of an ABM Treaty was the acceptance that a nuclear war is not winnable. By breaking the ABM Treaty, the U.S. was signalling that it now had the capability to defeat Russia in a nuclear war. In each case, the global media regards these as cases, not of bad faith by the U.S., but a consequence of its domestic politics. No other country would be allowed to make breaking of international treaties an “internal matter” of the country. This excuse is only available to the U.S., the rogue nation, whose domestic politics trumps – or Trumps – international treaties. Lest we think that reneging on JCPOA can also hurt the U.S., we need to remember that the JCPOA had front-loaded Iran’s commitments. Only after fulfilling its commitments, would Iran benefit from the withdrawal of international sanctions. The U.S. has therefore managed to scale back Iran’s nuclear capabilities significantly, and it’s now proposing to reimpose sanctions on Iran and pressure others to do so as well. To recapitulate on the Iran agreement, at the time of the agreement, Iran had reached a threshold in which, a nuclear breakout was a matter of few months. The JCPOA resulted in Iran reducing its number of centrifuges from 19,000 to about 5,000; it reduced its inventory of Low Enriched Uranium (3.7 per cent purity) by 98 per cent – from 10,000 kg to only 300 kg. The Arak heavy water reactor for producing plutonium was repurposed for producing only radio isotopes for medical purposes, and the Fordow facilities for enriching of uranium were converted to a scientific centre and producing stable radio isotopes. Our inspection work has doubled since 2013. IAEA inspectors now spend 3,000 calendar days per year on the ground in Iran…We collect and analyse hundreds of thousands of images captured daily by our sophisticated surveillance cameras in Iran — about half of the total number of such images that we collect throughout the world. Let us – for the time being – forget that it was Obama that signed the Iran deal and Trump that pulled out of it. Instead, think of the larger picture; that the U.S. wants to weaken Iran and map out its military targets. Would it not be to its advantage to reduce Iran’s inventory of fissile material from 6-8 bombs to virtually nothing? Then use the IAEA inspectors to identify possible military targets using what Amano talks above, “hundreds of thousands of images captured daily by our sophisticated surveillance cameras”. Let us not forget the documented history of IAEA inspectors working with the U.S. intelligence agencies to collect information about Iraq’s military targets, and high security governmental facilities. Was the JCPOA a charade so that the U.S. can first soften Iran, and then take out Iran’s current government? Just as they did in Iraq and Libya, after Saddam Hussein and Gaddafi both had agreed to give up their weapons of mass destruction? 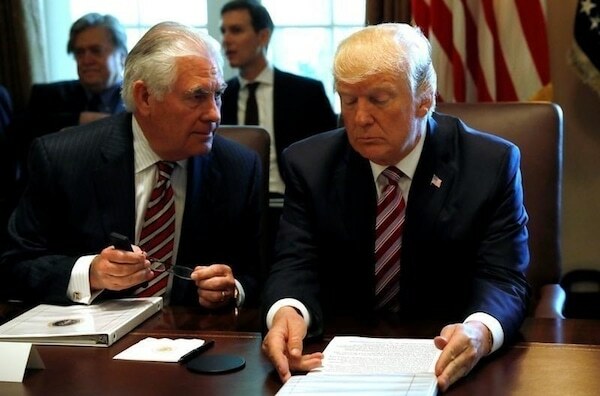 It is strange that the U.S. does not see any problem in entering into a discussion with North Korea, asking for it to dismantle its nuclear program, against some assurances that itself may give regarding peace, denuclearising the Korean peninsula and withdrawal of its troops from there. If it can walk out of an agreement that it had with Iran, in which Iran scrupulously fulfilled its side of the bargain, what is the value of any agreement that any country can reach with the U.S.? Can the U.S. deliver on any promise it makes? What is the value of any agreement that Trump may reach with North Korea, if he decides that the U.S. does not need to abide by any international agreement it reaches? Why would North Korea take Trump and his promises seriously? This must surely be the question that confronts DPRK. If the U.S. cannot be trusted to adhere to any international treaty, then what is the purpose of reaching any agreement with the U.S.? For the U.S., any treaty is for imposing conditions on others, while accepting none for itself. It does not matter if it is climate change, or any arms limitation treaties. Whatever conditions it accepts, it reneges without fear of any consequence. All the while talking about how unreliable Iran, North Korea and others are! The blackmailing power of the U.S. over the global community comes from its financial clout. Most global trade is in dollars, as also most international transactions. The U.S. has therefore the ability to threaten foreign banks with sanctions, and freezing them out of the global financial system, if they do not “obey” the U.S. domestic laws. For Iran, things are not as bad as it was for Iraq and Libya. Iran has enough conventional military strength not to be invaded and destroyed, as Iraq and Libya were. It is also considerably larger in size, its economy much more resilient after years of U.S. sanctions. With rising oil prices, its ability to withstand is that much greater, particularly as it has China as major trade partner. The petro yuan that China is floating, may also lead to new trade alignments, free of the stranglehold of the dollar. The other imponderable is the European Union. They have said that they will not abandon the JCPOA, and will therefore not re-impose sanctions on Iran. Iran has also said that they will adhere to JCPOA, and in 5+1, only 1 has walked out of the agreement. That might indeed be true, that JCPOA continues minus the U.S. It is possible that this is the decisive moment in history where the U.S. hegemony, particularly over the global financial system finally breaks. Or we could face another West Asia war, in which the U.S. again invades another country in the region. With untold consequences. At this point, the world is poised on a knife edge. This is indeed a dangerous moment in history. For the world or the U.S.? Or for both?